I HAD gone from the summit of Everest to a modest Scottish hill where the greatest peril was likely to be a stubborn wall of cows in little under an hour. As a day of mountain contrasts, yesterday could not have been more extreme. I had spent the morning having a coffee and a chat with Vicky Jack, the first Scots woman to have scaled the Seven Summits, the highest peaks in each continent. Vicky and I have been paired up for an appearance at Glasgow’s Aye Write! literary festival on Saturday, March 18, and we were touching base before the big event. Titled Mountain Quests, the event will be chaired by broadcaster Anna Magnusson, but I have to admit I was somewhat surprised by the pairing. It felt to me like one of those mis-matched tag-team bouts from ITV’s Kent Walton wrestling programmes, or those A vs B music mash-ups. After all, the nearest I have got to Everest is a double glazing leaflet through the door. However, as is often the case when mountains are on the menu, we discovered so much common ground, even if on a much grander scale. Vicky stood at the top of the world on May 18, 2004, the culmination of a seven-year quest to reach the Seven Summits. Her extraordinary adventure is recounted in the book The Sky’s The Limit, which has just been reissued. Yet this modest and quietly-spoken lady still describes herself as a hillwalker rather than a climber. 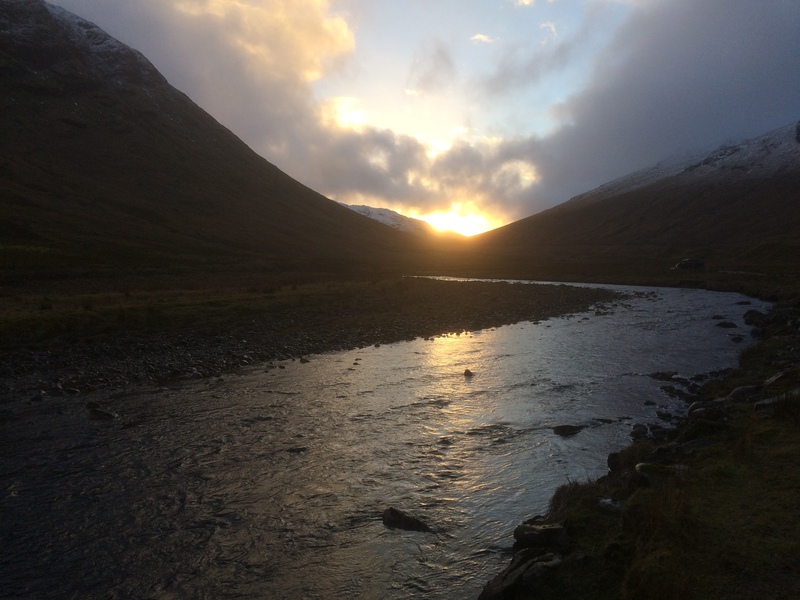 She regards her completion of the Munros in 1996 as a huge achievement and cites a long summer traverse in the Cairngorms as one of her most magical hill days. It was after finishing Scotland’s highest mountains that a casual conversation in the pub set her on a new quest, to climb the highest peak in Europe, Mount Elbrus. There was no turning back after that. Kilimanjaro followed, then Aconcagua in South America. The stakes were getting higher with every peak, the expeditions and climbs tougher. Next was the Vinson Massif in Antarctica and then the gruelling ascent of Denali (Mount McKinley) in Alaska. The Carstensz Pyramid in Indonesia proved problematical in different ways – sneaking in under cover of darkness to avoid gun-toting militias around the gold and copper mines. And then the grand finale – Everest. Vicky laughed as she talked of how the Sherpas believed she was merely walking up to Base Camp, or how a team of loud American alpha males barely gave her a glance. Yet she proved more than a match for them when it came to the crossing of the Khumbu Icefall. This is the make or break for many expeditions, a jumble of enormous ice blocks, some the size of houses, constantly in danger of shifting or collapsing, and deep crevasses which involve walking over the void on ladders lashed together. This proved too much for the Americans and, nerves frayed, they retreated off the mountain. But Vicky’s steely determination and calmness under pressure got her through. The now quieter Americans saw her in a different light after that. Ten years on, and, despite living a quieter life, Vicky still looks like she could run up a mountain without getting out of breath. Sometimes she does. The common ground? The determination, obsession even, with achieving targets and the need to have those targets to keep driving on, how we saw mountains as an antidote to working long hours in high-pressure jobs and the sheer love of the outdoors. I laughed when she said that she was actually quite lazy. I could identify with that. I always used to liken myself to a lion – spend most of the day sleeping or lazing about but ready to leap up and chase a gazelle when the occasion arises. We parted and I headed off to Inverlochlarig. 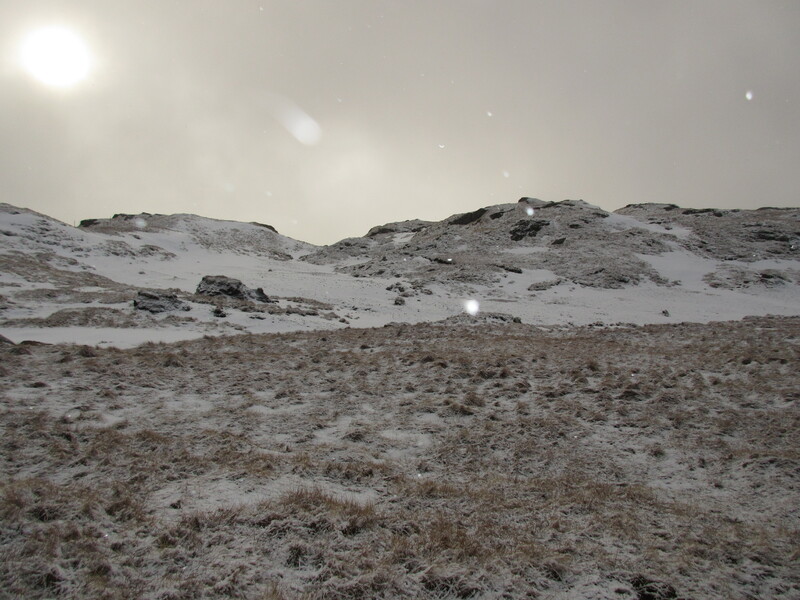 The trek to the head of the glen was thankfully cow-free and accompanied by bright sunshine. 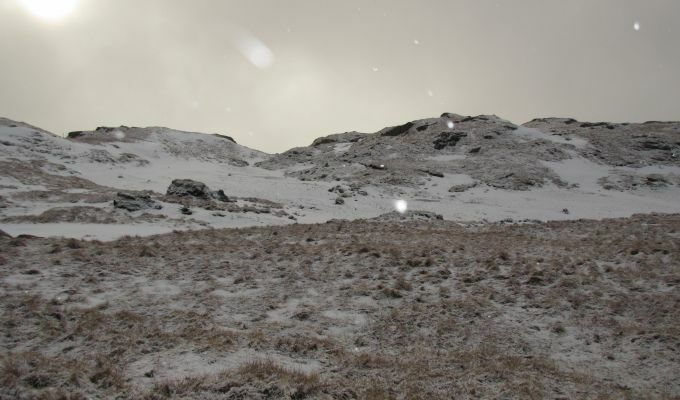 By the time I was on the summit of Meall Mor, the snow was driving in. It seemed only right after a morning talking about Everest. It was a privilege to spend time with Vicky, and I look forward to a successful event and more surprises in Glasgow.